The dream became a reality when The Pavilion opened with a star-studded gala weekend in April 1990. As The Pavilion celebrates its 30-year anniversary this season, it continues growing with a spectacular lineup of performing arts events including a special performance by The Boston Pops On Tour, seven Houston Symphony performances, a full production of La Bohème by Houston Grand Opera and a mixed repertory piece by the Houston Ballet. The Pavilion will kick off its 30th season with a special performance by The Boston Pops on Tour Thursday, March 21, as they celebrate the music of John Williams, one of the greatest film composers of all time. The venue first welcomed the symphony in 2002 and is excited to host this unique opportunity for the community to see “America’s Orchestra” perform on the Main Stage once again. Presented by Woodforest National Bank, the evening will feature excerpts from the composer's best-loved scores, such as Star Wars, Harry Potter and Jurassic Park, as well as some lesser-known gems. Orchestra tickets range from $35-$50 and lawn and mezzanine seating will be free. The beautiful dancers of the Houston Ballet will take the Main Stage for their Mixed Repertory program on Saturday, May 4. The evening will feature the premiere of Come In, a contemporary work for thirteen male dancers, as well as sample pieces from the company’s recent performances including dazzling excerpts from Raymonda, Oh there you are and The Ladies. Celebrate the end of school and start of summer with a concert and movie! On May 30, take an epic, fire-breathing adventure at DreamWorks’ How to Train Your Dragon In Concert. Composer John Powell’s Academy Award-nominated score will be performed by the Houston Symphony and perfectly synchronized to every scene of the movie in a thrilling experience for all ages. On August 29, be treated to another concert and movie as the Symphony performs live and in sync with the film that gave the world one of its greatest movie heroes, Indiana Jones, at Raiders of the Lost Ark in Concert. 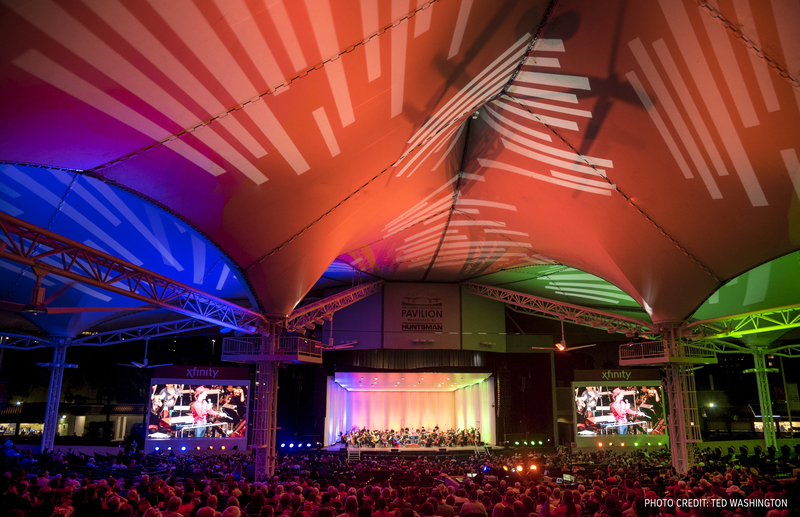 As the “Summer Home” for the Houston Symphony, attendees are guaranteed to be entertained all season by an exciting lineup of orchestra performances including The Music of Tom Petty on April 20, An Evening with Frank Sinatra and Ella Fitzgerald on June 8, A Symphony of Heroes on September 11 and Hocus Pocus Pops on October 18. Enhance your experience with a Performing Arts Season Subscription! For $200-225 per seat (pricing varies with time of purchase) you can enjoy orchestra-level seating to all Houston Symphony, Houston Ballet and Houston Grand Opera performances at The Pavilion as well as the Boston Pops On Tour performance, on-site garage parking, admission to the Woodforest Bank Club for each performance and more. Performing arts subscribers also receive preferred seating and on-site garage parking for free events including the Houston Symphony’s Star-Spangled Salute, the Texas Music Festival Orchestra and Holly Jolly Jingle. The total value of the performing arts season package is $510. Children’s Festival is not included in season subscriptions, but individual tickets are available for purchase. Thursday, March 21: The Boston Pops on Tour, The Music of John Williams (Presented by Woodforest National Bank) 7:30 p.m. / Gates: 6:30 p.m.
Saturday, April 20: Houston Symphony, The Music of Tom Petty 8 p.m. / Gates: 7 p.m.
Saturday, May 4: Houston Ballet, Mixed Repertory 8 p.m. / Gates: 7 p.m.
Wednesday, May 22: Houston Grand Opera, La Bohème 8 p.m. / Gates: 7 p.m.
Thursday, May 30: Houston Symphony, How to Train Your Dragon In Concert 8 p.m. / Gates: 6:30 p.m.
Friday, June 7: Texas Music Festival Orchestra 8 p.m. / Gates: 7 p.m.
Saturday, June 8: Houston Symphony, An Evening Frank Sinatra and Ella Fitzgerald 8 p.m. / Gates: 6:30 p.m.
Wednesday, July 3: Houston Symphony, Star-Spangled Salute (Free Event) 8 p.m. / Gates: 6:30 p.m.
Wednesday, August 29: Houston Symphony, Raiders of the Lost Ark in Concert 8 p.m. / Gates: 7 p.m.
Wednesday, September 11: Houston Symphony, A Symphony of Heroes 7:30 p.m. / Gates: 6:30 p.m.
Friday, October 18: Houston Symphony, Hocus Pocus Pops 7:30 p.m. / Gates: 6 p.m.
Thursday, December 5: Holly Jolly Jingle (Free Event) 7:30 p.m. / Gates: 6 p.m.